I decided right after I got off the plane from my 10 day Caribbean getaway complete with all inclusive delights like lobster and top shelf all you can drink liquor, I was going to do a detox. I've never done a detox or cleanse before quite honestly because I feel like I eat kinda right (no sodas, not lots of red meat, organic fruits and veggies) plus I didn't want to do the LA thing which is all about the Master Cleanse or whatever diet-antioxidant-related-thing is hot right now. Detox, short for detoxification, is the body's natural, ongoing process of neutralizing or eliminating toxins from the body. For one I knew I was not going to do anything that was going to last more than a couple of days because I have an active lifestyle, I got to work 10 hour days and I don't do well with hunger...at all...like I loose concentration, turn violent...it's quiet scary! So I decided to try the Dr. Oz 48 hour Cleanse. When I heard cleanse I was thinking I needed to be near a bathroom for two days, but when I took a gander at the ingredients list I didn't see anything that would cause emergency situations (if you know what I mean). Even the prune use is very little and didn't do much. One thing I wasn't expecting with my 48 hour cleanse plan was the cost of the groceries! It came close to $60! Mostly because I had to buy containers of things I never owned before and used a little of i.e. flax seeds, flax seed oil, sauerkraut! The upside, I find myself looking for new recipes to incorporate these leftover ingredients (flax seeds in my oatmeal and caraway seeds add another dimension to any broth based soup). I perused the Recipe List before I started to make sure it was not juice only and its not. 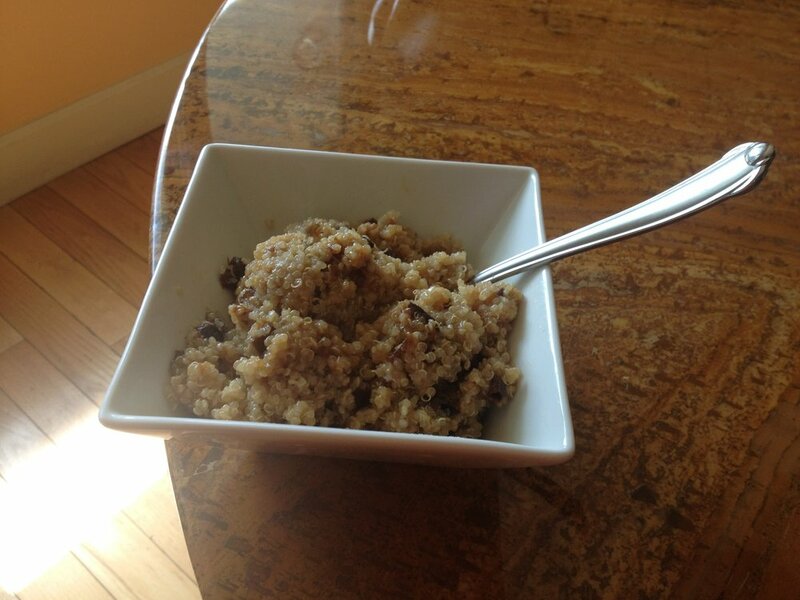 Breakfast was quinoa and prunes which was the equivalent to oatmeal with raisins. Watch out though, I found quinoa to be very very bloating and I just wish I could of added some vanilla or sugar up in there and it would of been bomb! Otherwise it was pretty 1800's oatmeal before sugar came to England. The detox drinks (2 recipes) one involved using a juicer (my first time and oddly not as daunting as it looks!) and the other recipe was just pouring all ingredients together. The kale cucumber juiced drink was definitely refreshing throughout the day but it was the POM Pomegranate Juice and pineapple juice mix that was truly delightful - I will definitely be making this punch in the future (maybe with a splash of Malibu Rum). The fresh veggies snack, which was a mix of raw green beans, radishes, and cucumbers (you can add celery as well but I am not a fan of that stuff). They also recommend tossing it with some lemon juice, pepper, salt and olive oil (a typical blend of salad dressing I love soaking raw kale in!). It was good when you got the hunger pangs, but usually it only kept the pangs away for about 15 minute intervals. There was also the fruit smoothie for lunch that I forgot to take pictures of it because I was always famished when lunchtime came around I almost drank it straight out the blender! But it was by far, next to the Pomegranate Pineapple mix drink, one of my favorite recipes that was filling - I am thinking of using it for a replacement breakfast or pre/post workout drink. The vegetable broth soup was my third favorite recipe in this strict regiment. I really like light soups for dinner since you are not really active right before bed. It was nice to learn how to make a quick and savory broth just by roughly cutting up vegetables, mainly fennel, cabbage, and red onion then adding some water and spices. Next time I want to add maybe some Jamaican white or yellow yam and maybe some tofu. It also took only one hour to boil and it was a nice big pot you could keep ladling from. Overall, the results of the cleanse were not exactly obvious when monday morning arrived. I did loose two pounds which was not my goal but I knew I would quickly gain that back within 6 hours (it was Labor Day and bbq was calling my name, haha). The entire weekend I was actually really really energized and alive and didn't feel the need for a nap once. I even exercised on the second day, doing synchronized swimming for two hours and felt totally fine and not hungry whatsoever - I was really worried I was going to pass out in the water! I do say that if you want to adhere strictly to the regiment and have an active social life, you have to walk with your goodies. I bought a car the first day I started the cleanse and I bought a lunch box with the fresh veggies and a canister of the detox drink to the dealership with me! I didn't want to be tempted by their free burgers and hostess cakes they were offering that day! I also went to a bbq later in the evening that was actually serving really healthy food but I resisted and survived, even though the spiked punch seemed tempting to sip while hanging out with my friends. I also bought about three canisters of detox drinks and the blueberry smoothie to practice the next day and drained all of them by the end of practice. So I was pretty committed to following and eating only those recipes. One drawback was actually after the detox was over, I felt rather sick and unusually tired my first day of regular eating again. It didn't help that my first meal post 48 hour detox was two pancakes and turkey sausage links, I promptly took a two hour nap on the couch! Later that evening it was the same effect. I think my body was getting used to working overtime to break down processed food again. I think a 48 hour detox is not going to work any instant miracles but it will give your body's filtering systems like your kidneys and liver a break from the toxins we put in our bodies daily. I would like to keep elements of the 48 hour detox in my everyday meal regiment if I could i.e. continuing juicing and replacing a meal with a smoothie but I don't think I would attempt this again unless I really had the money available and was ready to commit to another arduous 48 hours. It was definitely one of the hardest things I've done in my life.